A radioactive chemical element that was discovered in 1789 by the German chemist Martin Heinrich Klaproth that was named after Uranus, which was then a newly discovered planet. The element accumulates in the Earth's crust in the form of mineral deposits such as pitchblende, uraninite arnotite, and autunite. These recoverable ores are generally called uranium and are mined and used as the main source of extremely high energy nuclear fuel. The energy extracted from one pound of uranium, for example, is equivalent to that of three million pounds of coal. Easily accessible uranium reserves are found in large concentration in Canada and the United States, as well as in Africa, Australia, Brazil, and France. Within the United States, New Mexico has the second-largest (after Wyoming) uranium reserves, and mining operations were established in the state, especially in the Grants mineral belt area, in the 1950s. Production continued throughout the 1980s but then declined significantly. Due to potentially harmful levels of radiation, uranium mining and processing are hazardous both to workers and to the environment, and today many organizations call for the closing or limiting of mining operations. The Navajo Nation, whose reservation lands contain the majority of known deposits in the state, currently holds a partial, temporary ban on uranium mining, but since it is a profitable resource, there is an ongoing controversy regarding the benefits and dangers of uranium production. 2006 The Navajo People and Uranium Mining. Albuquerque: University of New Mexico Press. 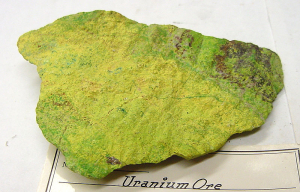 N.d. Encyclopedia Britannica Online: Uranium. http://www.britannica.com/EBchecked/topic/619116/uranium-U, accessed October 27, 2014. N.d. Encyclopedia Britannica Online: Uranium processing. http://www.britannica.com/Ebchecked/topic/619232/uranium-processing, accessed October 27, 2014. 2015 Wastelanding: :eagcies of Uranium Mining in Navajo Country. Minneapolis: University of Minnesota Press.